Positional plagiocephaly is also known as deformational plagiocephaly, benign positional molding, posterior plagiocephaly, occipital plagiocephaly, nonsynostotic plagiocephaly, or flat head syndrome. It is usually diagnosed between the ages of 3 and 12 months of age with a peak prevalence at 4 months. As opposed to craniosynostosis, it results from late gestational or postnatal mechanical forces applied to the infant’s skull (18, 32). Diagnosis can usually be made clinically, with imaging studies reserved for rare cases. Management includes measures to avoid pressure on the flattest part of the head such as repositioning and, in some cases, cranial orthotic devices. 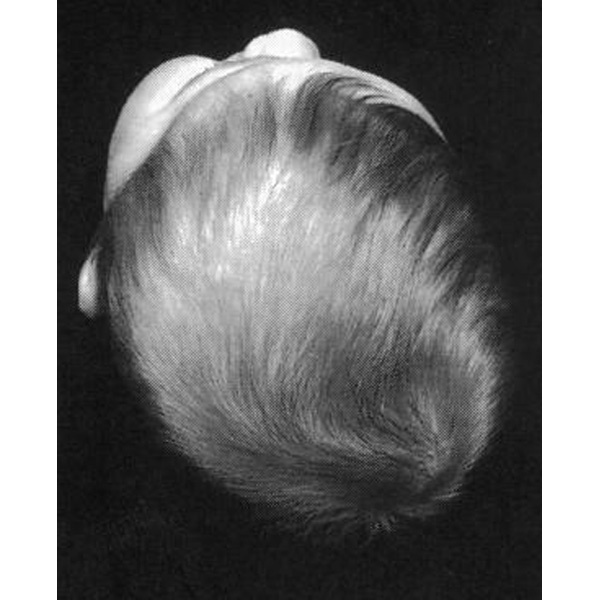 Due to external force: Positional plagiocephaly results from external forces applied to the pliable infant skull in utero or postnatally. Six-fold increase: Incidence increased nearly six-fold with the 1992 American Academy of Pediatrics (AAP) recommendation to avoid a prone sleep position to reduce the risk of SIDS (35). The prevalence is estimated to be as high as 20% by age 4 months. Diagnosis by examination: Diagnosis is made primarily by physical examination and does not require imaging. Treatment nonsurgical: The condition can be minimized by providing the infant with a minimum of 30 minutes of “tummy time” while the child is awake each day (23). Treatment includes repositioning, physical therapy, neck stretching in those with torticollis, and cranial orthosis in severe or refractory cases. Outcome expectations good: Outcome with nonsurgical measures is typically excellent, and there is rarely a role for surgery. No clear data exist to support the occurrence of developmental delay in those with positional plagiocephaly.